I have a serious book problem. They seem to breed in the isolated corners of my house. My kindle has helped the accumulation considerably, until Ireland. I have visited at least 4 bookshops since arriving, and have purchased 6 titles: 3 guidebooks, and 3 fiction books. 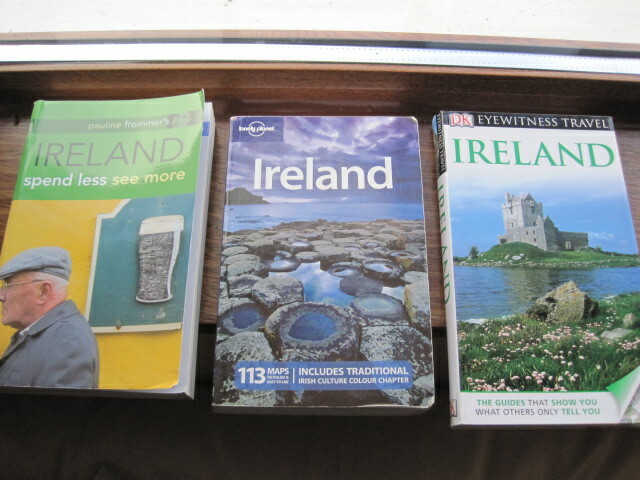 The three guidebooks I purchased while in Ireland. 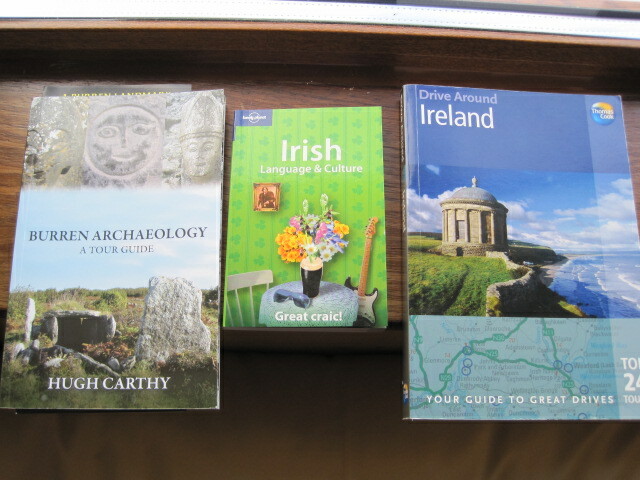 I bought Irish Language and Culture in Clifden, and the others (Drive Around Ireland and Burren Archaeology by Hugh Carthy) in Ennis a few days ago. Burren Archaeology was very enlightening as Jared and I stopped at a few places discussed in the book, and I read about them while we were there. I am currently following one of the drives in Drive Around Ireland. 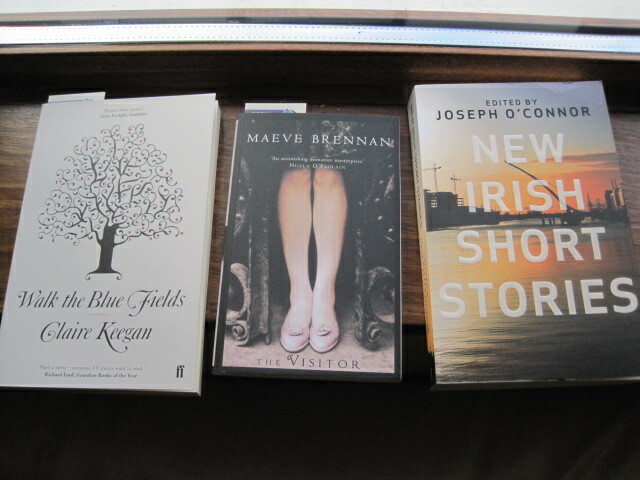 These are the books I brought with me from the US. The Lonely Planet guide has been extremely useful – the best by far. I haven’t used the others at all, though I do love the excellent pictures in the Eyewitness Travel guide. 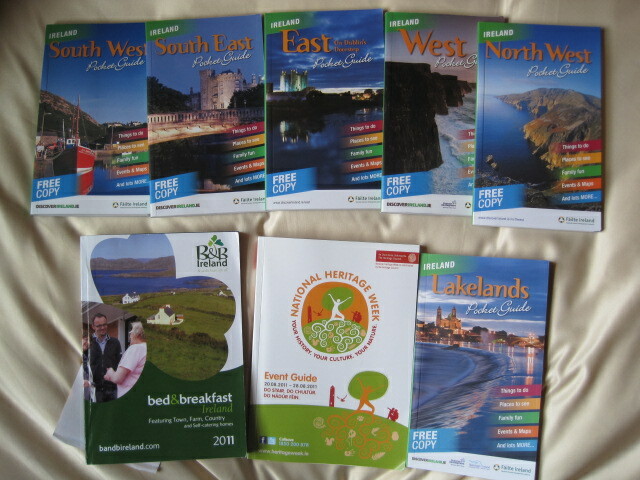 These are the free regional guides that I picked up along the way at various tourist information offices. These will not be coming home with me. I’ll leave them in the last B&B where I stay for the next person to use. Each one has a good map in the back, though I’m not interested in hitting any more of the tourist destinations listed within – I got that out of my system in the first week. Fancy sheets!!! Are you in the honeymoon suite?? Haha! This is actually the least expensive room I’ve stayed in during the entire trip, but yes, the sheets are pretty fancy. Mmm.. polyester. Hi Laina: Are you going to try to learn Gaelic? How was your birthday in Ireland? I am picking up some Irish words, and I have a phrasebook. My birthday was actually 2 days before I left; I worked all day, but had a nice dinner.